Imagine a stargate portal opening up and you can see your dreams. It is like a time traveling machine, a wormhole. If you step through it now, you take a short cut to manifesting the reality you have been desiring for quite some time now. But yet maybe you hang back, nervous, wondering if it’s safe to step through. You have never been through a portal before, what if something scary happens? What if you are not prepared? What if it’s not what you expect when you get there? As you stand conflicted, frozen in fear and doubt, the portal slowly starts to close. Do you step forward boldly into the unknown? Or do you play it safe? Stick with what you know? Today is the first new moon of 2019 and it also holds the energies of the first solar eclipse in Capricorn. Think of the solar eclipse energy as jumper cables for your new moon energies! Take this opportunity, this portal of manifestation and run with it; get really clear on your short and long term goals, dreams and ambitions. Write them down, add them to your God Box, do a new moon ritual to breathe your desires to life. 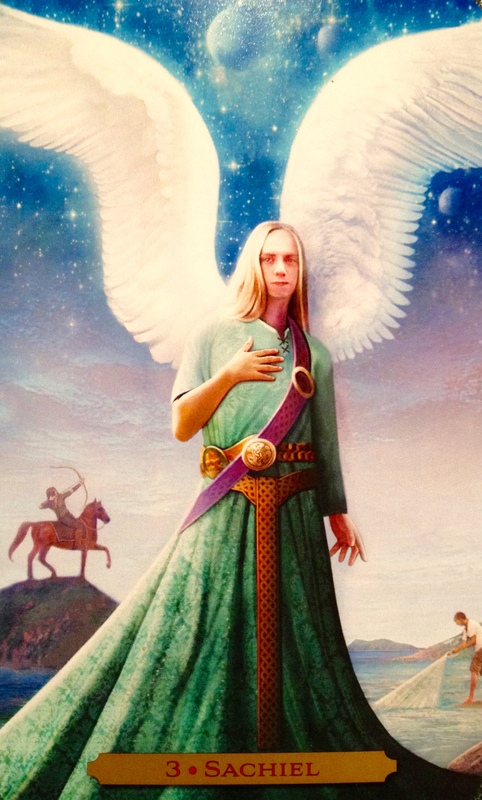 Archangel Sachiel is here to gently nudge you forward. He is asking you to trust your heart, to aim for the stars. He urges you to step forward and do not look back. Your past is not your future. This is all new. Everything you need awaits you. Even if it doesn’t at first seem as so. There may be a curve ball headed your way, but it is only to reroute you. Will it come if you stay paralyzed? Probably. Will it come if you step forward fearlessly? Possibly. But it is simply the Universe’s way of recalibrating your GPS. Do not let your emotions overtake you; do not let your ego persuade you to stay stuck. Breathe deeply and connect to your heart center. You may place your hand on your heart, just as Sachiel is doing above, this will help to direct your attention to this area. See your heart center opening and aligning with Sachiels heart center. Know that he is giving you the strength to move forward. Know that he will always be by your side, and that all you have to do is say his name, aloud or in your head, and place your hand to your heart to invoke him. Ask anything of him and he will assist you. But promise him that you will move towards your Soul path. One little step at a time. Take the leap, knowing that Good Fortune awaits you.